At Monticello, Thomas Jefferson built a north octagonal room and dome. The elongated dome with rear windows half clear and half mirrored was Jefferson’s twist on the Temple of Vesta in the Roman Forum, even though all temples to Vesta are reportedly round. Something about eight sides obviously impressed me, along with Jefferson’s seven-day clock, with its weights dropping through two holes in the foyer floor; large wooden window bins meant for holding massive ice blocks for passive air conditioning; and the passageways, kitchen, storage, and laundry rooms beneath lengthy porticos where Jefferson cleverly hid the domestic industry of the house that was performed by his slaves, some of whom were close relations. Much has been made of the fact that Jefferson inherited his slaves, but more importantly: he did not free them. Virginia’s school children of the 1960s were routinely indoctrinated with the genius of the founding fathers, who largely hailed from our state. That said, Jefferson did not invent much of anything, save a plow good for hillside cultivation, but he was an innovator of domestic space, incorporating a host of modern conveniences into his homes, including “double acting doors, lifts for conveying wine from the basement, self-winding clocks, weather vanes with indoor dials,” and functioning indoor privies for the winter months. I learned these facts of convenience from a chapter in Notable American Houses, edited by Marshall Davidson. Omitted from the discussion are Jefferson’s relations with Sally Hemings. Not notable, I suppose. Despite these technical innovations, the plans of Jefferson’s houses maintain and reinforce the prevailing social structures of his time, suggesting that he expected those structures to extend into the future, even as his political placement allowed him uncommon influence on the question of slavery. He was an architect of more than homes and gardens. Whether he personally subverted, while publicly upholding, these social structures is a question of heart more than fact. At best, Jefferson was ambivalent, which is not in his defense. He was less ambivalent about the fledgling Constitution and sought as president to undermine its power, leaving the nation in debt and without a standing army when he left office. Perverted power cannot be redeemed by private feeling, which time and time again brings us to the romanticized justification of Jefferson’s relationship with Hemings: notations of her white blood, her blood relation to the family, or their mutual love are no more than whitewashing. She was owned by him. On my first visit to Charlottesville and Monticello, I was in the seventh grade. I knew nothing of historical revisions of the Jeffersonian myth. I remember staring down at the graves below the back hillside garden. Our tour guide gave no explanation other than “This is the slave graveyard.” On my more recent tours of Monticello, the script had changed. And that’s the difficulty with the house on the little mountain and its construction of Jefferson. “This is an American thing: to wish longingly for a romanticized ancestral home,” Mat Johnson writes in his satirical novel Pym, which appropriates and appraises an unwieldy work by another revered Virginia figure, Edgar Allan Poe. “This is a black American thing: to wish to be in the majority within a nation you could call your own, to wish for the complete power of that state behind you.” Only gradually has the hypocrisy of Jefferson’s whole biography been exhumed. His university stands; his hallowed Grounds; sexual assaults real and imagined; a black student bleeding from the head, thrown to the sidewalk at the Irish pub. As I walked through Monticello on my first tour, the guides broadcast nothing but respect and awe, and I had no awareness that my identification with the narrative of Jefferson’s brilliance was inherently flawed and impossible, that even the university he founded was still inaccessible to me, as the last public university in the nation to admit women. I didn’t know I was barred from attendance when, on the same tour, we—boys and girls—walked along the tiered lawn of UVA and saw the Poe room, where a young man was honored to be living. I looked into the little room with a fireplace at its end and imagined myself there in the rocking chair, a college student reading a book like the disheveled, perhaps hungover male student in tattered bathrobe whom we had disturbed. 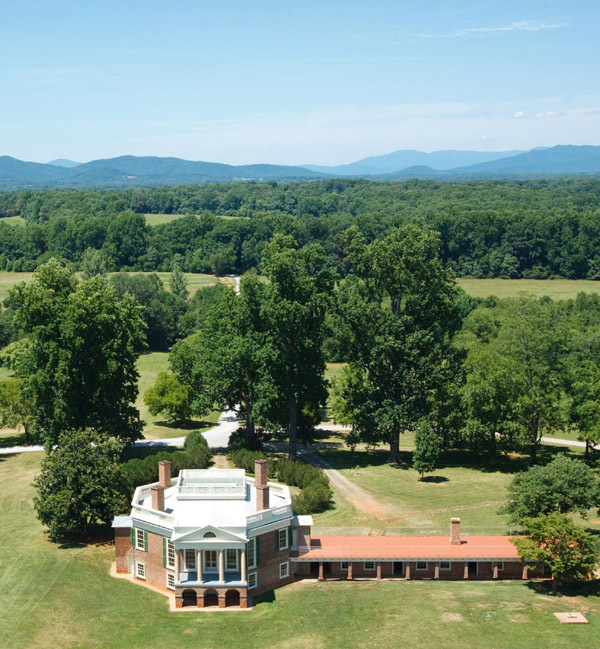 Poplar Forest, Jefferson’s octagonal country villa, served as his retreat from public life and was probably the house where he and Sally Hemings found fuller expression of their true selves in their relationship. Of course Sally served him there, before and after the passing of his wife, who no doubt also served him. Without the pressure of public life, the construction of Jefferson’s country villa would never have been started or finished; it was nothing less than his dream house away from the spotlight. And in this house there was a secret hidden in plain sight. Begun during Jefferson’s presidency in 1806, Poplar Forest with its bone-white columns, like much of our public architecture of the Federalist period, was inspired by Palladio’s villas and rendered in Roman revival style. If it had really been Roman, those columns would have been painted more brightly. Witold Rybczynski finds Palladio’s American influence remarkable: “That a handful of houses in an obscure corner of the Venetian Republic should have made their presence felt hundreds of years later and halfway across the globe is extraordinary.” Poplar Forest was held privately for years and underwent several façade renovations that obscured the strict geometrics of its original plan; its ongoing restoration only began in the 1980s. Thus, on my several forced marches through Virginia historic landmarks courtesy of the public school system, I was never subjected to a word about Jefferson’s second home, which was further west and much closer to where I lived than Charlottesville. As I drive the long narrow road to Poplar Forest for my first visit, I can feel the necessity of its location, its removal, and I am trying to reconcile what it concealed. The house is as secreted as my little red house in the Catawba Valley, set off the road and invisible to passersby, only accessible in Jefferson’s time by invitation. I know how important removal proved to the reconstruction of myself. Although I expected it at the time, I’m now surprised that family, friends, and lovers were willing to make the trip to visit me. The eight exterior walls of Poplar Forest required custom obtuse angled bricks to turn the corners, made on site by artisan and slave labor. Sometimes it overwhelms me to write sentences containing the word “slave” and then simply keep writing more words. It’s not just a word but means to be in exile, to suffer, to die, to survive somehow, to leave your blood mixed in the bricks of every historic place. A twenty-by-twenty-foot dining room at the center of the house, lit by a long rectangular skylight, radiates sunlight into the surrounding octagonal rooms. I stand in a thick shaft of light angling into this cube room after high noon. From here I can look in four directions of the compass, through double glass doors ushering additional natural light from adjacent rooms. Were I invited to dine, I’d pull up my chair to an octagonal table under the skylight, a specific theater set in which we break the fourth wall of history, served by others who can never dine with us. Architecture, gardening, and reading were Jefferson’s passions; there’s a strategically placed small library at the back of the Poplar Forest house, a transitional space to the lawn. And he “made hundreds of drawings, ranging from rather wobbly freehand sketches to measured drawings…drew plats, maps, city plans, garden designs, and furniture, as well as sections, elevations, and floor plans for numerous buildings.” He inherited precision drawing tools from his cartographer father, who had surveyed Poplar Forest plantation long before Jefferson inherited the 4800-acre plantation from his father-in-law. He brought other fine drawing instruments from London, finally favoring pencils and graph paper purchased in France, where he spent five years as US ambassador. Jefferson used his favorite French papers so sparingly that a few blank sheets still remain. How I would love to have a sheet of that paper! No matter how much we renovate Jefferson, I want to fill those surviving pages with his confessional chapters, truth telling written in his hand. Jefferson still owned slaves when he died, including some of the six children he fathered with Sally Hemings, although he had lobbied successfully to outlaw the Atlantic slave trade. I want to understand how this man could say what he did and do what he did, compartmentalizing so much psyche and intellect, dividing so much consciousness from action, private emotion from public life. I want to know how we walk tiered lawns of his university without stumbling. Witold Rybczynski, The Perfect House: A Journey with the Renaissance Master Andrea Palladio (New York: Simon & Schuster, 2002). Thomas Jefferson Foundation, “Drawing Paper,” Monticello.org, http://www.monticello.org/site/research-and-collections/drawing-paper.